When it comes to listing accurate efficiency and BTU output on their websites, there are only a handful of companies that you can trust. Updated on January 11, 2018 - For years, wood and pellet stove companies have listed exaggerated efficiencies and BTU output on their websites and brochures and no agency has challenged them for this practice. Luckily, the EPA has started to list efficiencies on their list of certified stoves, so consumers have a easy way to check company claims. Most wood and pellet stove manufacturers use a variety of ways to say their stoves are more efficient than they actually are, and that they put out more heat than they actually do. BTU output is the other area where manufacturers routinely report misleading data to consumers. In the case of BTU output, even the EPA was willing to post those exaggerated numbers on its website, further contributing to the problem. These issues are coming to light in the wake of new EPA regulations that require more accurate reporting and require manufacturers to post the test reports of independent labs that certify wood and pellet stoves. Many stove manufacturers are not complying with the new rules and will not post their certification reports for consumers to see but some companies are complying. A few companies stand out for providing the same efficiency numbers to their consumers as the independent test lab provided to the EPA. They are: Blaze King, Jotul, Kuma, J.A. Roby, Seraph, Travis and Woodstock Soapstone. Consumers can trust the efficiency numbers that these companies post on their websites and in their promotional materials. The same is not true of other companies, including many leading brands. Most companies list efficiencies using the European (LHV) method, which can produce efficiencies of more than 100% and make their stoves appear 5 - 8 points higher than they actually are. But some companies go further, publishing efficiencies that are 15 - 29 points higher than they actually are. The largest stove maker in the country, Hearth & Home Technologies (HHT), that owns Dutchwest, Harman, Heatilator, Quadra-Fire, Vermont Castings and others brands, published test lab reports for all their brands, several weeks after this blog first came out (in May 2016), which noted that they had not complied. The company also says that actual efficiency numbers from independent test labs are recorded in the owners manuals in their stoves. The result is that consumers see the exaggerated LHV efficiency on the brochures and website and then see the real number, often 5-10% lower, in the fine print of the owners manual. HHT companies provide their lab reports on pages like these for Quadrafire, Harman. For those and other HHT brands almost all the lab reports pre-dated the new EPA regulations, so actual efficiencies and BTU output are not included. HHT has declined to voluntarily disclose efficiencies, like companies such as Jotul and Hearthstone have done. One of the foremost experts in the hearth industry Dr. James Houck, an adjunct faculty member at the University of Portland in Oregon, used to work for Omni Test labs, the most well known test lab in the US. He says, “Many of the pellet (and cordwood) stove efficiency values have been produced by commercial labs which optimized conditions and calculation methods." A wood stove test lab. Under the new EPA stove regulations, known as New Source Performance Standards (NSPS), labs may be more restrained from optimizing conditions and calculation methods and will be producing more accurate efficiency and BTU output numbers for consumers. Still, labs are under pressure from their clients to produce the best possible emission, efficiency and BTU numbers, or they may take their business to a lab they think can produce the best numbers. The new EPA rules are requiring the test labs to produce more accurate BTU output data, which is crucial for consumers to right size the appliance for their home. The result will be that BTU figures posted by the EPA after May 2015 when the new rules began will be lower than the figures posted before May 2015. The EPA has not started enforcing some of the provisions of the 2015 regulations which are being ignored by many companies. And, its enforcement capabilities are slim, a fact that is not lost on the industry that it regulates. State agencies could help enforce the new regulations, particularly for manufacturers based in their states and if stakeholders in the state pressure them to do so. Under the new rules, an independent lab testing the St. Croix Hastings pellet stove reported that it produced 7,000 – 27,000 BTU per hour. 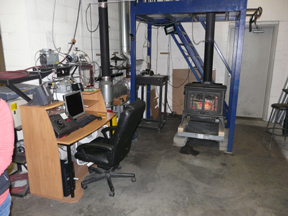 However, the St. Croix website says the stove produces up 40,000 BTU per hour. Many manufacturers used to use the BTU input, which is the amount of BTUs available in the fuel, rather than the BTU output from the stove. But The EPA has been recording estimated and often exaggerated BTU figures on its list of certified stoves for many years and it will be a slow process for them to start recording more accurate BTU figures from new test reports. The Alliance for Green Heat has urged the EPA to remove all exaggerated BTU data from their list of certified stoves and only post actual BTU output that is determined by an independent lab using an approved calculation. “The problem with companies using all manner of efficiency and BTU calculations is there is a disincentive to report more accurate numbers that would make your stoves look less efficient and less powerful,” said John Ackerly, President of the Alliance for Green Heat, a consumer focused wood heating non-profit organization. “The new EPA rules are starting to change what gets posted on its list of certified stoves, but manufacturers can still virtually post whatever they want on their websites and no state or federal agency monitors that, as they do with cars and most consumer appliances,” Ackerly said. Some companies are beginning to post their lab reports on their websites, so consumers who want extensive technical details can have access to them. The reports are dense, often long and hard to digest, but can provide useful insights for those who want very detailed, technical information. Blaze King, Enviro, Kuma and St. Croix were the first to post test lab report for all their stoves. Jotul and HHT companies Quadrafire, Harman, Vermont Castings, Heat & Glo, Heatilator, Majestic and Eco-Choice now post them as well. For some companies, such as St Croix, those test lab reports reveal that they have far higher efficiency and BTU numbers in their promotional materials. Lab reports can also help consumers understand what air settings or power levels their stove is likely to be cleanest, dirtiest, most efficient and least efficient. Lab reports from testing that was done prior to 2015 usually do not have efficiency numbers or have been whited out. Some of the posted lab reports are from as early as 1989, are hundreds of pages long and by test labs that no longer exist such as EEMC, Lokee Labs and Northwest Testing. Advice for consumers: Beware of efficiency and BTU output claims on websites and promotional literature of wood and pellet stove manufacturers. The only companies who accurately report their efficiencies on their websites that we are aware of are Blaze King, Kuma and Seraph, Travis and Woodstock Soapstone. The EPA’s list of certified wood stoves contains more and more actual efficiency numbers and is one of the few reliable places for efficiency information. Many companies are still holding out disclosing lab reports to consumers. If you want to be certain you are buying a higher efficiency stove, buy one that discloses their actual efficiency and actual BTU output on the list of EPA certified stoves. For more information on this topic and a list of stoves that have actual efficiency numbers, check our blog post, A Review of Wood and Pellet Stove Efficiency Ratings.